From the SkyMart and SkyPlaza at Hong Kong Airport to Tai O Market there are an amazing range of shopping choices on Lantau. Here are a few not-to-miss items. Tai O is a fishing village. 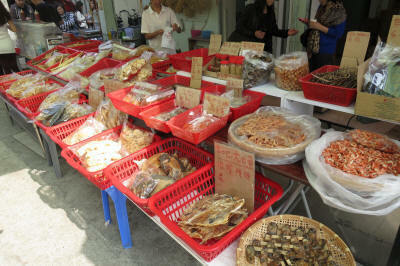 Today, the locals are still fishing and preserving various sea creatures for sale. Dried shrimp paste and dried shrimps are one of the best sellers. The Ngong Ping Village is a culturally themed village next to the NP360 cable car. Besides the attractions about the Buddha (e.g. Walking with Buddha) and local Hong Kong culture, there are various souvenir shops in the village selling Chinese handicrafts. Hong Kong's biggest famous brand name outlets can be found in Lantau. It's the Citygate Outlets. Conveniently connected by the MTR underground, the Citygate Outlets is home to over 90 international brands' outlets. A must-visit for any smart shoppers. Don't forget to visit their website and download e-coupon for special offers!